Scuba Diver Ocean Planet magazine recently featured the whale sharks of Gorontalo. 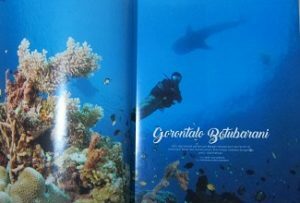 Gorontalo’s new whale shark reserve at Botubarani Village became a featured destination in Scuba Diver Ocean Planet magazine. “Gorontalo Botubarani” encompasses four pages. This includes a dramatic double page photo of a whale shark swimming above a diver. In the foreground of that photo lies some of Gorontalo’s beautiful coral. Noteably, Mr. Arief Yudo Wibowo took this and other photos for the feature. He is the managing editor of Scuba Diver Ocean Planet magazine. The accompanying article features research from the Indonesia Whale Shark Team. Its members lived in Botubarani village while conducting their study. They lived there from April 12 to April 30, 2016. As a result, they recorded a total of 17 individual whale sharks. All were males. Worldwide, females rarely appear. Furthermore, the lengths of Botubarani whale sharks measured three to seven meters. That means all of them are juveniles. Since whale sharks are migratory, the researches expect that total to rise. Indonesian Minister of Marine Fisheries directive 16/2013 designated the whale shark as a protected species. The Scuba Diver Ocean Planet magazine article on Gorontalo explains the characteristics of Botubarani Village. It sits on the edge of deep ocean waters. Near the shoreline there is a rocky shelf. This shelf is at most four meters deep. A steep slope falls to 15 meters. Then comes a deeper inlet about 30 meters deep. Consequently, this inlet provides direct access to deep ocean water. No net or fence blocks access to deep water. As a result, whale sharks are free to come and go. The reason they frequent this particular underwater inlet is simple. A shrimp factory is located there. For years now, workers have thrown the unused shrimp heads and skins into the water. The whale shark like these snacks! These snacks do not provide enough nutrition. So, the whale sharks still must forage for plankton and minnows on their own. Miguel’s Diving placed a half page advertisement in Scuba Diver Ocean Planet magazine. We want responsible divers to know that we follow the procedures recommended by Indonesia Whale Shark Team. That includes keeping an appropriate distance. 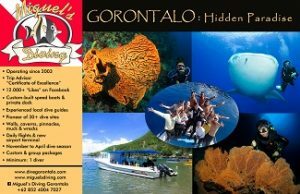 For your chance to dive with whale sharks in Gorontalo, please contact with us.